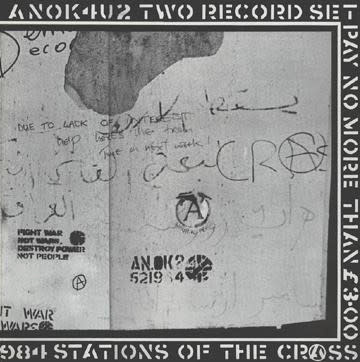 Stations Of The Crass is the second album by Crass, released at a time when right-wing National Front leaders and working class Oi! bands were using punk rock as a medium for their xenophobic message. Originally pressed as a double 12 inch in 1979, the record includes live tracks from a gig recorded at the Pied Bull pub in Islington, London on August 7, 1979. Crass countered the trend with seething rage, wicked wit, and a potent musical attack that spurned punk's pub-rock origins for harder and faster chaos. The follow up to The Feeding Of The 5000, this offering finds them delivering furious anti-capitalist sentiments on a bed of guitar and bass designed to deliver an uncompromising message.